The more that I think about the problems that we face, big or small, the more that I believe that collaboration is the answer. Get, say, five very different people in a room and you get not only five different brains, but also the different perspectives, knowledge, connections, energy and resources that they all have access to. An example for me is the issue of protecting our environment in Surrey whilst providing reasonably priced homes for our young people. I am very keen to see both achieved and believe that the focus should be on “win-win.” This can only be done by getting a range of people together to look at these issues. I am therefore very pleased to have been invited to represent young people in Surrey on the Surrey Nature Partnership Board (SyNP) and I attended my first meeting last week. SyNP has a strategic remit for “sustainable land management use, supporting the economy and promoting health and wellbeing” and works in conjunction with the Local Economic Partnerships. It is very much seeking to work with different groups, including developers, to achieve win-win outcomes for the environment and the economy. Collaboration was the key solution listed for another social problem this week – ensuring all children learn to read well by age 11. Thanks to Beccy Bowden at Satro for passing me an interesting report entitled “Reading England’s future: Mapping how well the poorest children read.” This is available on the Save the Children Website. In some areas, many children have already fallen behind with the groundwork needed for literacy by the time they go to school. In other areas, they enter school with a reasonable level, but then fall behind. Surprisingly to me, children from low-income families in smaller towns and rural areas are particularly likely to fall behind in reading. Cities are doing okay – in fact London is top performer in the country. London’s success was previously thought to be due to improvements at secondary school level, but this study has shown that it is London’s primary schools that are making the difference. The conclusion of the report was that we need local action - “schools, parents, early years services and the wider community to unite and to own the goal of all children reading well.” There couldn’t be a more perfect cue for me to mention again that Communilab will be our online forum enabling online collaboration to solve issues facing young people in Surrey. We will be launching in the new year. I am very excited, we have a lot of people and organisations interested in the project from a wide variety of areas – businesses, Surrey County Council, universities, third sector organisations, schools and colleges, health organisations, local councils. Our main Sponsor is Barclays and we also have Community Champions including Penningtons Manches, Surrey County Council, Pfizer and Exxon Mobil. 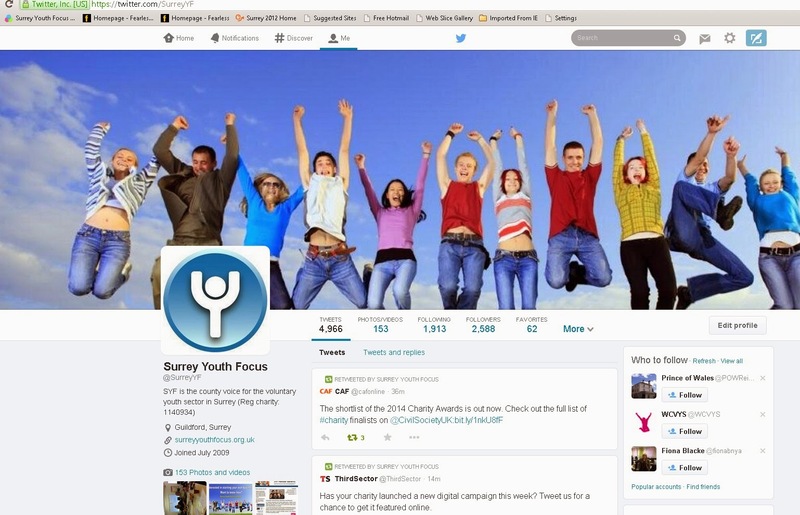 I believe that it will make a significant difference to young people in Surrey. If you want to be kept informed click here. Honesty, dishonesty and too much disclosure? The subject of honesty has come up in several different guises of late. Most people would, if asked, say that they are not dishonest. However, with the British stiff upper lip and “mustn’t grumble” approach we often hide feelings and thoughts, especially in the workplace. At a recent workshop on leadership, we were encouraged to be more honest in our dealings with partner organisations. As money gets tight, the “elephant in the room” with a group of statutory bodies and/or third sector organisations can often be money, where all organisations play a defensive game to protect their own staff. One leader of a public sector organisation said that she wanted to be more honest in meetings with partners. It is well known that many young people are now choosing to reveal large portions of their lives in great detail for the world to read. Is this too much disclosure? Many feel that it is. However, some may give a very censored view of the world – talking about all the great parties that they have been to, the friends they have made, but not the anguish they are feeling. When some young people look at the social media of others, they believe that everyone else is having a good time but them. I have chosen not to regularly use Facebook or other social media to share my private life. Instead, to keep up with various friends around the world, I prefer the very outmoded Christmas Letter. Various people have expressed different opinions on how to write a letter. One person didn’t want to put in that his mother had dementia – people want to hear good news at Christmas, he believes. Another acquaintance said the opposite - he didn’t like letters full of happy events only - news about expensive holidays, house extensions and achieving children – since it left him feeling inadequate. When it comes to children, people often write about all the positive things about their children, sounding like they are bragging, but on the other hand, if one of your children is having difficulties, it may not be a good service to the child to tell the world about their problems, especially given that the child may read it themselves. Overall, I think the world could do with more honesty, more honesty about thoughts and feelings, both concerns and also positive feelings when things go right. This is particularly true in face to face meetings, which are, perhaps, different from our broadcast communication from the world. I have had two "honest" conversations recently where I considered which route to take and chose in the end to be direct. The scenarios are still working themselves through, so I cannot say whether my path has worked yet, but I certainly felt better afterwards for having been honest with the person rather than hiding my opinions and feelings. So, my challenge to you this week is to reflect on your own honesty. Are you putting up a front with someone, when underneath your thoughts and feelings are very different? Would honesty be the best policy? How do you want to shape the moral compass of young people in your life when it comes to honesty? What a difference a week makes. If you read my blog last week you will have seen that I was feeling rather delicate following the sudden illness of a close family member. I am so relieved to say that he has progressed as well as can be expected and we are starting to wonder when he may be ready to come out of hospital. You will also have read last week that I gave myself permission not to be at peak performance, to work a little slower, to prioritise the most important tasks and to give time to those in my life who needed it. I now feel back on form, ready for the brain to engage and solve issues, ready for the fingers to fly over the keyboard. However, hopefully by giving myself permission last week not to be at peak performance, I will have given myself time to process difficult emotions, to deal with the situation and to maintain my mental health going forward. Mental health issues are frequently in the news these days. I was particularly sad to hear the story of the 16 year old girl in the West Country who had been sectioned but was held in a police cell for two days whilst the police tried to find a more suitable place for her. Children and Adolescent Mental Health Services (CAMHS) are due to be recommissioned soon in Surrey. I very much hope that we can find a way to give support to every young person who needs it in Surrey. I believe that the third sector can play an important role in this and am talking to people involved to encourage collaboration between all the appropriate parties. My question to you this week is this: when times get tough emotionally do you give yourself permission to stop, to rest, to reflect and deal with the issue? Or do you carry on life at your normal pace, determined to push on and get things done, regardless of your own emotions and those of people around you? Similarly, are you teaching the young people in your life how to pause and take the time to look after their mental health when life gets tough?